Leads the reader to study and personal reflection, considering the practical ^implications of Scripture. This one volume contains all of Jensen's Self-Study Bible ^Guides to the New Testament. Leads the reader to study and personal reflection, considering the practical ^implications of Scripture. This one volume contains all of Irving Jensen's Bible ^self-study guides to the New Testament. IRVING L. JENSEN (B.A., Wagner College; S.T.B., Biblical Seminary; ^Th.D., Northwestern Theological Seminary), was professor and chairman of the department ^of Bible at Bryan College, Dayton, Tennessee, and the author of numerous books, ^including the entire Bible Self-Study Series; Jensen's Survey of the Old Testament; ^Jensen's Survey of the New Testament; Jensen's Bible Study Charts; Acts: An Inductive ^Study; Independent Bible Study; and How to Profit from Bible Reading. 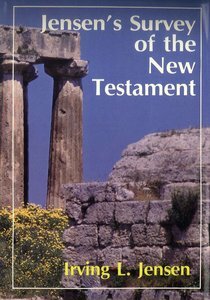 About "Jensen's Survey of the New Testament"
Leads the reader to study and personal reflection, considering the practical implications of Scripture. This one volume contains all of Irving Jensen's Bible self-study guides to the New Testament. IRVING L. JENSEN (B.A., Wagner College; S.T.B., Biblical Seminary; Th.D., Northwestern Theological Seminary), was professor and chairman of the department of Bible at Bryan College, Dayton, Tennessee, and the author of numerous books, including the entire Bible Self-Study Series; Jensen's Survey of the Old Testament; Jensen's Survey of the New Testament; Jensen's Bible Study Charts; Acts: An Inductive Study; Independent Bible Study; and How to Profit from Bible Reading.